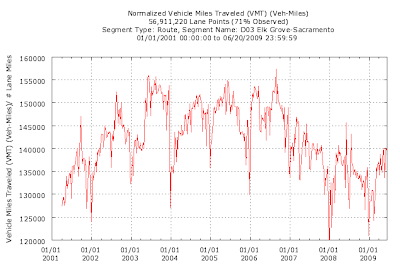 While traffic is indeed increasing vs 2008 on both freeways, it is still well below peak levels in June for previous years. 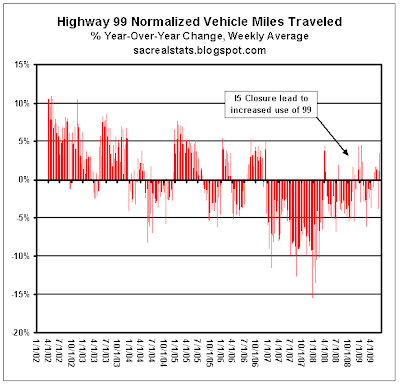 June 2009 US 99 traffic is 10.3% below the highest June value (reached in 2003! 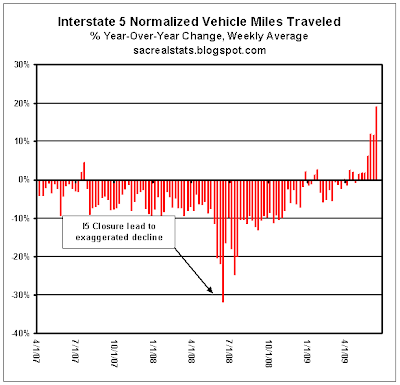 ), and June 2009 I5 traffic is 7.3% lower than the June 2006 value. So we're not looking at the increase in I5 traffic over last years closure due to work on the boat section (see the note on the chart regarding the 2008 reduction) ??? I think they need to look at this all together as right now the XY 50 freeway has heavy construction on it and I can see anybody who can bypass it would (from EG taking I5 to downtown and or around to 80 instead of 99 to 80). Sometimes they just need to leave the cubicle to analyse the stats. Remember, these are the same folks who design some of our favorite merges! 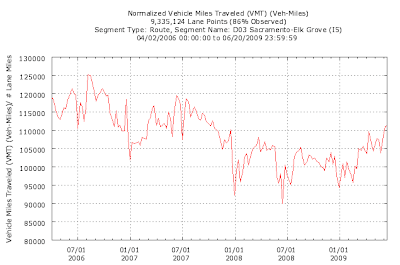 What we're looking at is a relatively static variable (vehicle-miles driven) in an otherwise highly dynamic system. When alternatives exist (trip timing, rerouting, avoidance), they will used, which makes near term predictions impossible. 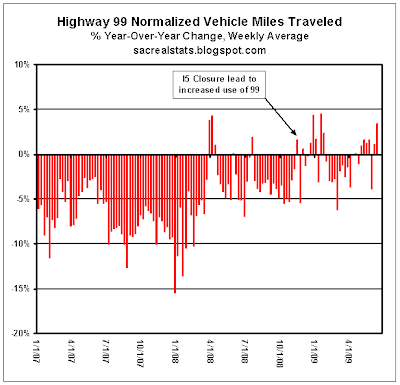 What I found interesting about the I5 closure last year was how little it effected traffic on 99. Most of the closures happened at night, and there were relatively few commute periods impacted, especially southbound. Also of note, the y-o-y increases began less than a year after the closures began. Obviously we'll know more once 3Q is over, but to me this looks like a meaningful increase in traffic. Sorry about that, first cup of Java hadn't kicked in, or maybe I was mourning Farah or something. The original drop off could be related to dropping residential construction as labor and materials originate up and down 5 and ended up in elk grove, west sac, woodand, natomas, plumas etc....all but shut down over the winter but maybe 25-35% recovery since. OK, back to CALTRANS. Considering they are the transportation agency for one of the largest economies in the world, I expect that they would use properly trained statisticians to analyze the data, not just some extra engineers they have on hand with access to Excel and not rely on the graphic artist to help us form an opinion. I would expect them to release the analysis with the data. Max, over here in the blogosphere, I would hold you to a different standard, afterall, you're a volunteer. With that said, I have more respect for your looks at the data over the past 3-4 years, and I've learned much from you, Lander, CR, the other guy who helps you, even AB ...while all the pros and ivy league grads who missed it coming while they were paid to watch. while all the pros and ivy league grads who missed it coming while they were paid to watch. I think Peggy Noonan was onto something when she opined that prozac and zoloft may have lead to excessive risk taking on Wall Street. I think there's another dimension to antidepressant-caused complacency: dispassion and conflict avoidance. It's not that people are afraid to rock the boat; it's that rocking the boat doesn't even cross their minds.